It’s a book of poetry with prescience, power, and a coherent view of an often off-kilter world. 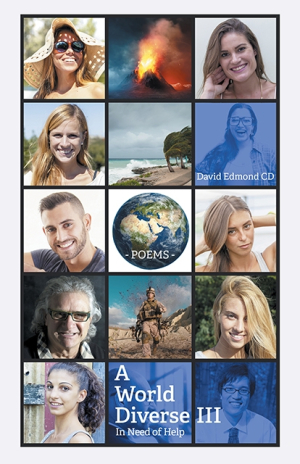 David Edmond’s A World Diverse III: In Need of Help amasses well-wrought poems about self-realization, responsibility, goodwill among neighbors, and other big-picture issues. The forward-looking collection of poems is the third entry in the A World Diverse series, a compilation of verse by a Scottish-Canadian poet who served in the military for more than three decades, lost his wife to Parkinson’s disease, and turned to poetry as a way to articulate his philosophy of life and loss. This poetry emerged from the real world rather than from an ivory tower of academia. The poet knows deep, authentic things about friendship, childbirth, and gamesmanship. He conveys hard-earned lessons on subjects like independence, time, and aging, as in the poem “Growing as We Age,” in which the poet talks about how bones and organs enlarge and the mind grows until a sedentary lifestyle leaves the elderly and infirm with little more than aches, pains, and immense regrets. Language and descriptions are plain, but are not without literary merit. Poems meander along with musings about the present, past, and future, deploying techniques like repetition and assonance with an orator’s refined ear. The poems collected in the book express their meanings clearly and leave little to interpretation, expounding on love, success, and other broad themes for those interested in self-improvement. “Richness Abounds,” for instance, looks at how “life cannot be bought” and how there are greater rewards than the number of zeros at the end of a bank-account balance. Poems benefit from detailed specificity, as when domestic tranquility is embodied by “glistening white snow on the ground” outside a window as the poet ponders whether young parents or elderly retirees have it easier in “Serenity Imagined.” They eschew the obscurantism of so much rarefied verse in favor of straightforward storytelling. A man overcomes loneliness by giving his time in “The Volunteer,” and realizes he can reap rewards once he understands “you have the talents and offer up yourself.” Such entries don’t exist in isolation; they’re followed by thematically appropriate poems that advance their stories. A World Diverse III looks at how we live now and what the future holds; it’s a book of poetry with prescience, power, and a coherent view of an often off-kilter world.